Sept. 13, 2018 | 7 p.m.
Sept. 14, 2018 | 7:30 p.m.
After 18 years and hundreds of performances, Kirstin Chávez, internationally renowned mezzo-soprano and Artist in Residence at the School of Music, knows Carmen inside and out. Her dedication to performing means that as she has played the role of Carmen she has also learned how to flamenco dance and to play the castanets. She physically inhabits the character in such a way that she becomes, for a short time, Carmen herself. On Sept. 13 and 14, Chávez will perform her one-woman show “Carmen Inside Out” at Kingsbury Hall as part of the UtahPresents performance season. She created the show, in part, to take back the narrative of Carmen from the nasty, self-centered character she is often portrayed to be. She has been in many different versions of “Carmen” productions, including one set in an art museum and one set in a German concentration camp. But she said, regardless of the setting, directors often misunderstand the character. They see her as one-dimensional, a mean, narcissistic, promiscuous, angry character who lashes out for no reason and ultimately brings about her own demise. 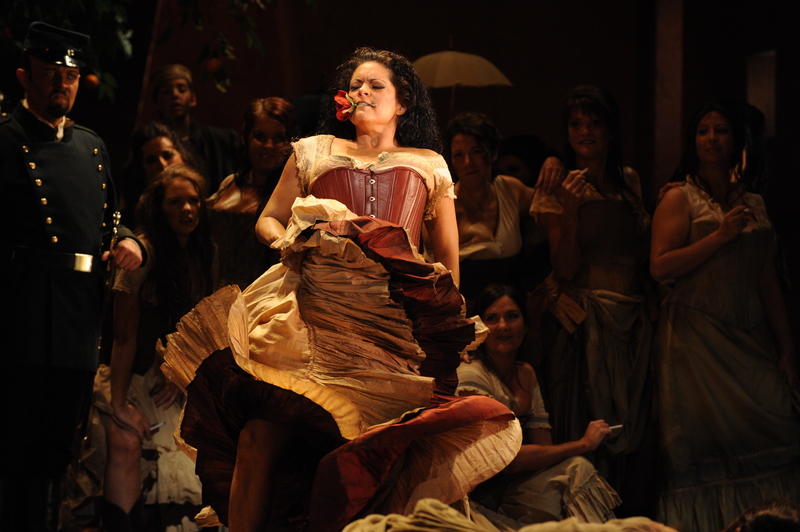 But Chávez points out, “If you want to be true to the score, it paints a distinct picture of Carmen as multi-dimensional, fiercely loyal, loving, strong and true to herself.” As she more fully inhabited the role with each performance, Chávez found many important things to learn from Carmen. In addition to casting a new light on the character of Carmen, Chávez was very interested in the idea of an interactive performance, allowing the audience to experience the performance on a more personal level. In its production at Kingsbury Hall, the audience will be seated on the stage, mere feet away from the performance. By bridging the usual distance created by performing on a stage across an orchestra pit, “Carmen Inside Out” allows the audience to experience the score, the story and the character herself on a whole new level. Chávez will be taking the performance on tour to cities in the US, Europe and Asia in 2019, supported in part by an Incentive Seed Grant from the University of Utah. Don’t miss this chance to experience “Carmen” like never before.